Finally-- THE Irrigation system you've hoped for-- the Redneck Irrigation Kit! Don't waste money on a professional! And don't wander around the big box stores hoping to find the perfect parts for a stellar irrigation system. 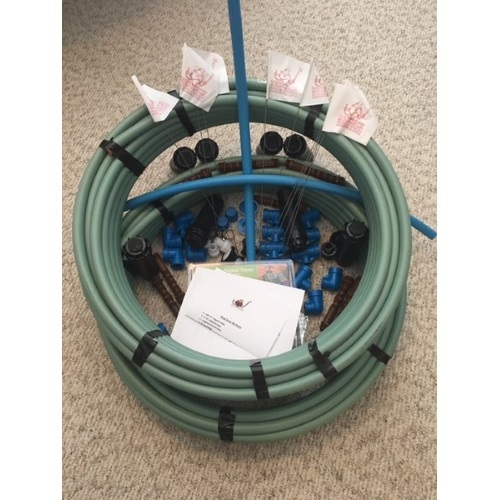 We have put together every possible component you need to install an irrigation system that will fool even professionals! No need for a bunch of tools-- just a shovel and the Redneck Irrigation Kit! Even the connectors are press-to-connect! This system waters up to 12,500 square feet of lawn (need more? less? See our systems!). In as little as 6 hours, you can have a complete and easy-to-use irrigation system. Comes with complete instructions and link to video instructions. Why buy the Redneck Irrigation Kit? You don't have to be a redneck-- just someone who enjoys the EASY and INEXPENSIVE life!